UNIVERSITY PARK — Michigan quarterback John O’Korn had far from a quiet week building up to the whiteout game against Penn State. The Huntingdon native, whose mother works at The Naked Egg breakfast restaurant in State College, had to deal with the emotions of returning to his childhood town and playing in an electric Beaver Stadium that he frequented growing up. 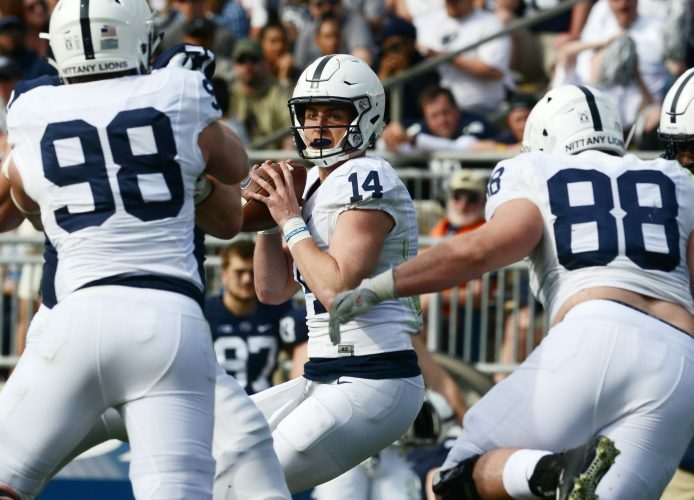 Added to the nostalgia of O’Korn’s return to Happy Valley was a myriad of criticism and ridicule for his recent lackluster 58-yard passing performance against Indiana. Heading into the game against Penn State O’Korn was predicted to be the likely cause of a Wolverine loss. While his 166 yards passing with no touchdowns or interceptions would not be confused as being a spectacular night, O’Korn extended countless plays moving outside the pocket to buy his receivers more time and give the stagnant Wolverine offense a chance at moving the ball against the Penn State defense. O’Korn completed a pass of 24 yards and had the Wolverines’ longest rush of the night with a 14-yarder. Instead the vaunted Michigan defense was the culprit for the lopsided 42-13 Nittany Lion victory. Entering the game the Wolverines owned the nation’s top defense that allowed just 223.8 yards per game. Penn State, however, exploited the Michigan defenders to the tune of 506 yards and scored more points by halftime than the Wolverines had allowed in a single game all season. Not helping Michigan’s cause was the Wolverine offensive line. Even with O’Korn dodging and eluding would-be Penn State tacklers, the Nittany Lions managed to sack O’Korn on seven occasions. With a negative media storm likely to engulf the Michigan program in the coming days, O’Korn knows that the team must remain focused and not distracted by outside opinions. Moving forward for the Wolverines who now stand without a legitimate shot of winning the Big Ten, O’Korn and his teammates draw from the 2016 Penn State team as an example of what may lie ahead. Running back Karan Higdon shared his quarterback’s perspective. Michigan plays at home against Rutgers next week, a likely easier game than the last three gut-wrenching weeks that have seen the Wolverines lose at home to Michigan State, beat Indiana in overtime, and be blown out by Penn State, to regroup before the season’s final stretch.